WARRIORS START SEASON IN STYLE! COUNCILLORS 'PITCH' FOR LOCAL SPORTS CLUB! A new innovation support service is helping a County Durham company develop a pioneering approach to tyre safety. Innovate Durham, which is led by Teesside University, is helping Silent Sensors to grow skillsets in its business as it develops its innovative tyre management system. The company, which is based at Netpark in Sedgefield, specialises in products and services using RFID (radio-frequency identification) tags, sensors, energy harvesting and data delivery. 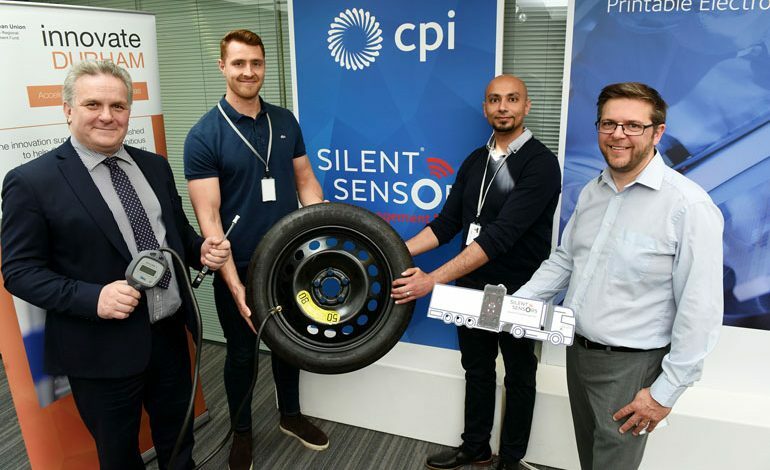 In collaboration with compressed air product manufacturer PCL, Silent Sensors is developing a tyre management system which uses its technology to monitor tyre pressures and temperatures. This information is uploaded via the cloud to a dedicated app allowing users to monitor the wear on vehicle tyres. The technology has the potential to deliver major safety benefits, along with a multitude of uses for fleet management. After identifying a need for more expertise in software development, Silent Sensors turned to Innovate Durham’s Knowledge Exchange Internship scheme. Knowledge Exchange Internships are part-funded by the European Regional Development Fund. They bring together a talented graduate with a university specialist or industry expert to work directly on company projects to help deliver new or improved products or processes. Silent Sensors’ electronic development engineers Sam Evans and Waleed Elmughrabi worked with Tyrone Davison, a principal lecturer in Teesside University’s School of Computing, Media and the Arts, to develop their software development skills. The firm’s CEO Marcus Taylor said: “We have two very talented electronic engineers working with us. “They identified a gap in software development skills. Working with Tyrone on this helped us really develop those skills. Innovate Durham project manager Suhail Aslam said: “We are delighted to have been able to provide support to Silent Sensors for this very innovative project. Horndale Community Association enjoys Goth day out at Whitby! © Aycliffe Today 2019. All rights reserved.